Where has the time gone?! While it's only been 3 or 4 months since my last blog post the subject of that post happened nearly 11 months ago! Ouch. Anyhow, now that the MBA (post on that to come soon) is wrapped up I better get back on the blog horse and talk about what's gone on this summer. First things first though, Meg and I took part in the MS Rona Bike Tour from Ottawa to Kemptville a few weekends back and had a blast. Meg's got an entry here and a few photos here. We made the trip to Kemptville in good time, stopping briefly at the various rest stops (which are spaced 10-15km apart) arriving into Rideau River Provincial Park around 10:40 to have lunch. We were certainly amongst the front runners at this point and enjoyed the sausages, salads, chips and jellybeans(!) that they had available before heading back out on the road around 11:20 or so. Just across the river the route branches off with the long route going west, along the river and the short route heading straight a couple of kilometres into Kemptville. There are certainly some fast cyclists out on the tour, we were passed like we were standing still by a team of riders sporting CDIC jerseys but we held our own. One of the last rest stops we made before hitting Kemptville had a lady handing out home made chocolate chip cookies which were awesome. We saddled back up and made our way to Kemptville where we paused briefly before heading out on a 35km loop to the south of town. There didn't seem to be a lot of people on the loop, in fact we were only passed by one cyclist as we stopped for some water on the shoulder. After the loop we arrived at the Guelph campus in Kemptville and picked up our luggage, set up our tent and showered. From there we took advantage of the freshly cooked corn and ice cream available to us before Meg settled in for a quick shoulder massage. Then it was off to the beer tent for a bit before dinner where we met up with our friends Grant and Bonnie and their three children Maya, Natasha and Jaida. The five of them did the trip, two on bikes towing trail-a-bikes with a child aboard and one with a trailer with another child aboard. Crazy! Dinner was served in the school cafeteria and then we headed to the ceremonies for a short bit before retiring fairly early. The next morning was a bit gloomy and so we ate, packed up and were on our way. 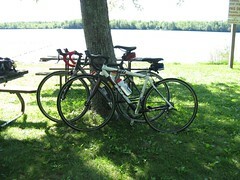 It was only a short 65km back to Ottawa and we arrived back before noon to a nice welcome and some lunch. All in all, we had a great time and look forward to doing it again next year. We were not sure what to expect as we hadn't gone for rides that long before, I think the most I had done this year was 70km, and the longest on our honeymoon was 60km so 115km was a great challenge. As I mentioned, we'll be signing up again for next year and hope that each of you will sponsor us once again for the great cause that fighting MS is.